GPA is a leader in the creation of Open Source Software (OSS) for electric utilities through collaborative development projects involving electric utilities, proprietary software vendors, research organizations and academia. GPA's OSS products and software components are easy for vendors to incorporate into their proprietary product offerings. GPA's OSS also supports the academic R&D business model and can be used to create new intellectual property. There is a very large and growing number of high-quality OSS solutions. Many companies have a strategy to encourage incorporation of OSS components in new software and systems. GPA encourages others to contribute software. Using the process shown to the left, GPA maintains the tested, high-quality source code repository as we grant permission to allow developers to contribute software to us. GPA also encourages others to distribute and provide support services for GPA's products. 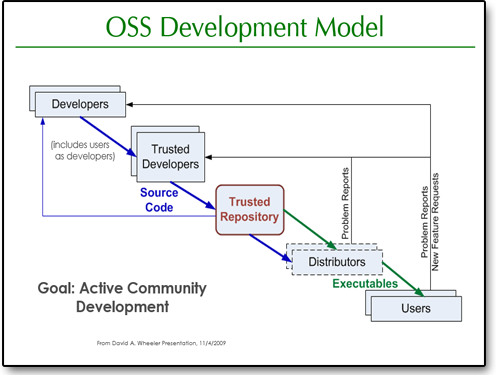 - David A. Wheeler, Why OSS?